The caption on this holiday card reads: “Merry Christmas and Best Wishes for the New Year. Walter E. Alessandroni.” Mr. Alessandroni was the PA State Attorney General from 1963-1966, serving under Governor William Scranton. The exact year for which this card was created is unknown, but estimated to be ca. 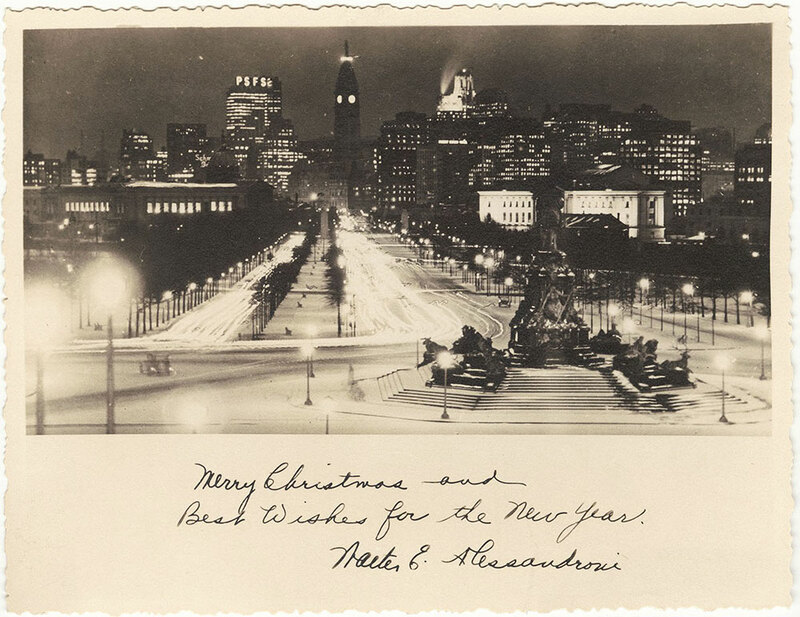 1965; but the wonderful photograph used, of the Benjamin Franklin Parkway at night, was probably taken around 1945. Of note is the PSFS Building in the background, opened in 1932 and granted National Historic Landmark status in 1976. Although the building was converted to a Loews Hotel in 2000, the iconic PSFS sign, with its 27-feet high letters, was retained, and can be seen for 20 miles.